After moving my sketches to a cleaner diagram I immediately could see how my thinking has moved on since 2001. I'm not even sure I agree with all of the word placements in that space. So I tried a "2010" version of the same thing. 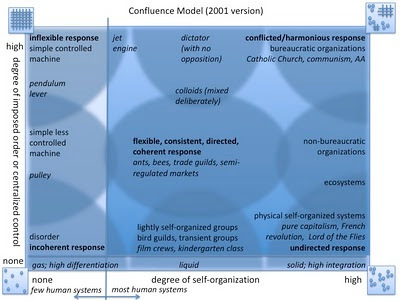 This also shows rotating/flipping it so that it matches the Cynefin framework. (If I went back to my original directions I'd go insane trying to remap them all the time.) The arrows mean that conditions of absolute purity only pertain to the extreme corners of the space. Thus perfectly pure hierarchy is barely represented (because it rarely exists in reality). In between these extremes, you can imagine all sorts of mixtures. 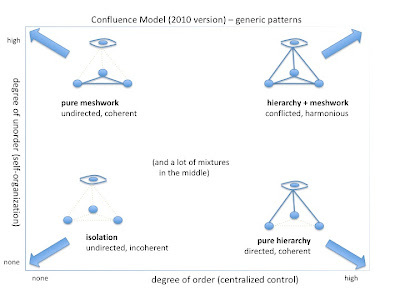 Here is another representation for the mixtures of hierarchy and meshwork which I used in a 2001 presentation. I think this one is easier to understand, but it's hard to draw on a chalkboard or the back of a napkin, and that makes it hard to use in practice. 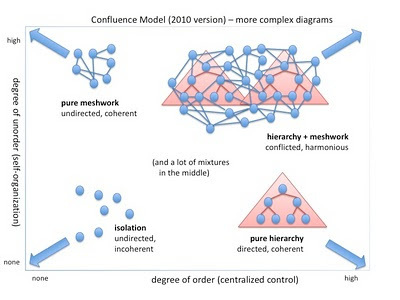 The reason the hierarchy+meshwork diagram is so much larger than the others is that I was trying to show how multiple hierarchies can be connected in larger systems that involve both confluent elements. Note that patterns outside of human invention rarely go all the way to extreme hierarchy, because nature is always messy and rarely isolated. Really serious order tends to reside only in human constructions (especially ones that never leave the controlled world of mental gymnastics). Also note that different patterns have different sizes on the diagram. That is my way of showing that some have more internal diversity than others. A beaver dam, for example, is much less variable than a migratory event. 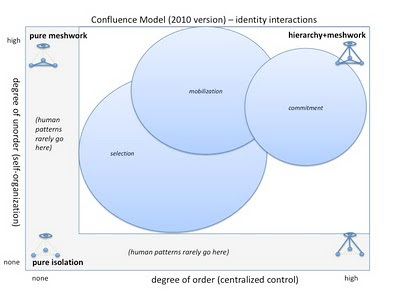 Mobilization of relational aspects of identity based on membership–based evaluation of importance operates across the complex/knowableboundary. 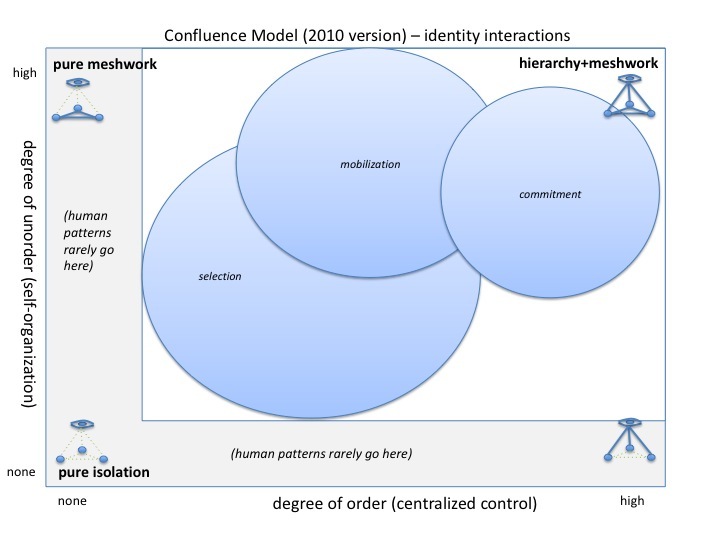 And looking again at these on the confluence model, I feel that they look like this. Notice that the circles get smaller as you move from selection (largest scope) to commitment (smallest scope). That makes sense. And last but not least, here is the medicine wheel mixed in. The arrows coming out from the circle denote the cardinal directions (those I have dealt with so far). 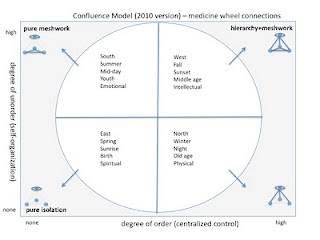 I originally drew the medicine wheel inside the "humans only conver these areas" part of the space. 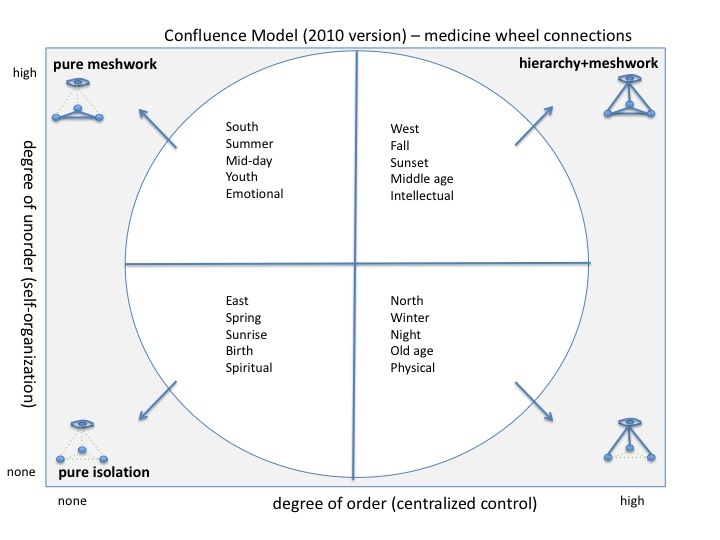 But the medicine wheel isn't only about human systems; it covers all of reality. So I think it should take up the whole space. (The only reason it doesn't is that the space isn't square.) It might be interesting to consider what the corners, outside the circle, might be, and whether the ancient teachings say anything about that. Much to learn. Doing this redrawing presents me with many new questions. For example, should gases, liquids and solids be on these diagrams at all? Is a solid more self-organized than a gas? Is it more ordered? Or is that distinction orthogonal to the whole thing? And where does chaos (as in chaos theory, not as in confusion) fit on this diagram? I have never been able to make up my mind about where it fits in, if it does. On the one hand, you could argue that chaotic patterns will be strongest in the lower left (as in Cynefin). On the other hand, some argue that chaos theory can explain things way up into the upper right (along with complexity theory). On the other hand, you could make the case that chaos is orthogonal to this whole thing and underlies everything that goes on, perhaps on a different plane. Or, you could just say that unorder = chaos + complexity and let it go at that. I'm not sure what is most useful. So there is much to think about. If you would like to think along with me, why not join in. I have no answers, only enthusiasm. OK, Cynthia, I am officially ready for the book. There is just so much deep stuff here, and I want to print it out [sorry, trees], read it slowly, and savor it. This is stuff that I will read once, then put down, then read again, and sometime later I will say, "Now I get it. Now I know how I will use it." Thanks John! What a confidence-inspiring statement. I can't seem to come up with anything to say in response that doesn't sound either preening or falsely humble. I end up with this reply (which doesn't sound TOO bad). I find that writing requires confidence not just in oneself but also in "the world out there" which will pass judgment on what is offered. The former I have some control over, but the latter can be, to paraphrase Pooh, sometimes a book and sometimes more of an accident. Feedback, even negative feedback, increases confidence in what is out there and improves writing, anybody's writing. I've written book-length texts before, but this is the first time I've confronted the issue of trying to "reach people" in any big way. It has taught me a lot about the value of feedback. It is making me want to write fan letters to every creator of a book/movie/game that has had a positive impact on my life (at least the ones who are still here to write to). It has also taught me that people who write book reviews and comment on blog posts and build connections, like you do, are probably much more important than you (or we) realize. Dear Cynthia, I am so glad I found you :-). You do tell the story of sense-making so well that sense-making is really making sense! Seldom have I 'seen' such genius balance between storytelling and rationality. It sure works for me!